9-Pin Narrow Carriage Impact Printer, Dependable High Volume Printing. 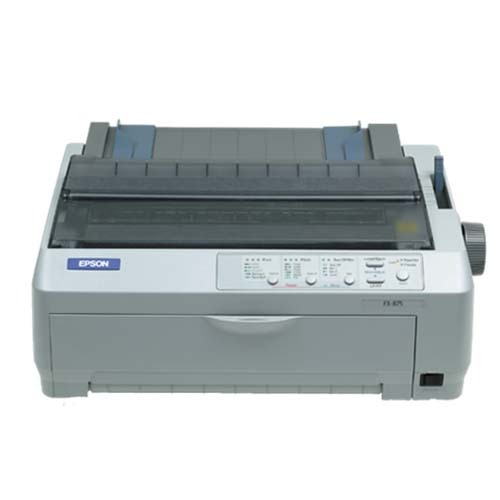 The high-value performer Epson FX-875 offers extraordinary efficiency with rapid speeds of up to 476 characters per second at 10 CPI in Ultra Speed Draft Mode. With its parallel, USB and additional connectivity options of a wide voltage range AC 90 to 270V, the FX-875 ensures quality printing at convenience. Epson’s dedication to durability is realised in the FX-875 impressive Mean Time Between Failure (MTBF) rating of 15,000 POH (power on hours), which offers excellent value for money.